UPDATE: Triple-O knives are shipping same-business-day when you complete your order before 1600 Mountain time! As you can see elsewhere, Triple-O stands for Out Of Options. The Triple-O is designed with exactly one purpose: to save your life when nothing else can. My philosophy is that you should ALWAYS bring a gun to a knife fight. Two guns. There are people who have enough skill to use a knife highly effectively, cutting tendons and generally taking out an attacker despite the limitations of the rather small tool you’re likely to have with you. I’ll be frank: I am not that guy. With a family and a business, I don’t have time to train extensively in knife fighting. Yet nearly every cop I know carries a knife, or 6, with the thought that doing so might be useful in a truly desperate emergency. Almost all of them carry “tactical” folders, and a handful carry push daggers. Realistically, when do you need a knife? When both your primary and back up guns are disabled, out of ammunition, or gone. When you cannot flee (because flight is usually preferable to a knife fight, even for a cop or soldier), and when you don’t have the strength to go hands on, or for that matter the guy is sitting on you and you can’t move. If the knife is coming out, you don’t have one foot in the grave so much as you’re standing at the bottom trying to climb out. Under those circumstances, how are your fine motor skills? How much control do you have over your fingers? Are you really going to be able to find the thumb stud of your folder or the button on your automatic? And do you think the guy trying to kill you—the one who took your gun and injured you so severely you can’t escape—is going to watch you fumble with a pocket knife and not do something about it? The Triple-O is a fixed blade—and a thick one, too. The thickness is carried right down close to the tip so that it’s unlikely to break. It has fat finger grooves to help you find your grip without having to actually try, and a big, tapered guard that will stop your fingers from slipping up onto the blade but still allow the knife to do its job. And of course, the blade itself is oriented upward—because the soft target is the belly, and powerful muscles like the biceps and shoulders can get the job done from a tight clinch position. Nobody wants to stab someone. But if you’re going to consider stabbing as a possibility, you have to consider the circumstances under which it might occur. They are what you might call “sub-optimal.” So your knife needs to reflect that, and the Triple-O does. How can I have more chances to win the 001 knife? 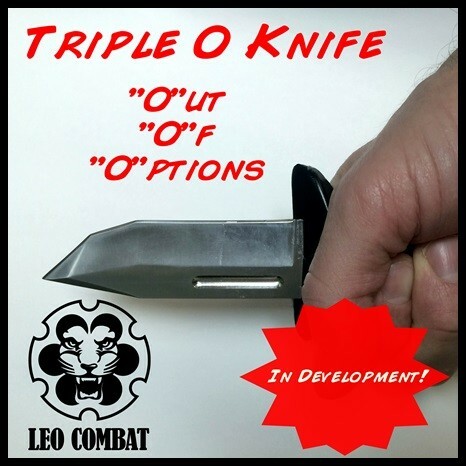 Hi Randall, thanks for your interest in Leo Combat! The rules limit you to 1 entry per household. So the only way to get another entry would be to convince someone from another household (friend, family member who doesn’t live with you) to enter and hope they are willing to turn it over if they win!